The HUD should still be considered in a WIP/Alpha state, although it's not unstable in any way. - Not (tested to be) complatible with any other HUD. - Only tested with a widescreen resolution of 1080p, unknown if it works with any other resolution or screen. - Make sure you load this LAST, else you may get into incompatibility issues. - NOT made for "Classic HUD", only the new HUD and its derivates work. 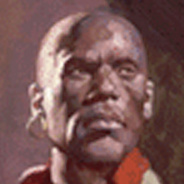 - Requires a small tweak to make it work as intended, although not exactly necessary. into the text file, preferrably from the bottom of "cl_interp_ratio 0.6". 'Thoughtlow' is just the fancy name of this HUD. It was meant to be Minimal while also a bit more Informative. Instead of using vague icons, this HUD uses text mostly as well as tries to make the HUD less obstructive by moving it, making it slightly less visible (But still good enough) and less too 'coloured' so it's a bit dark to the eye, making it less restraining. Bars for Health & Armor. - The bars that are more lighter than the others indicate a possible 'guarantee' that, if that bar is reached or depleted, picking up food or armor will surely bring you back right to full health/armour. (Remember this is NOT a complete guarantee). - The highly visible yellowish bar you see at the end of the HP & Armor bars is a GUARANTEE that you are at FULL HP or/and Armor, so you won't be needing to pickup any health or armor. - The green dots that appear when there's no yellow bar is an indication that, even if you may not have full HP/Armour, you have ONE number down, so you can pick up Health/Armour but it would be a total waste (since teammates could use it). - When picking up any kind of ammo, be it arrows/bolts, axes/javelins or gunpowder, you won't see an icon, instead, a text of it. - Semi-transparent so it won't block too much of the view. This is something you see by typing "hud_chargemeter_circles 1", highly recommended. - The circles will be coloured, especially seen on the charge bar which goes from dark red to light red and finally reaching its point to yellow. Yellow indicates the charge is ready. If you are not using "hud_chargemeter_circles", you'll see these classic bars. Some bars may still appear even if you use "hud_chargemeter_circles". - Bars are customized so they're a bit more unique and less obstructive while still remaining more informative. - Chargebar will appear as a gray bar that is slowly turning red and finally lightning up into yellow, indicating you are reaching or have reached the full charge. 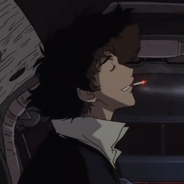 - Kick remains almost the same, but is now an edged transparent bar with a text. - Counter remains almost the same, but is now an edged transparent bar with a text. - The glow behind bars will now be a flamey orange instead of plain white. - Timer bars (For example, when you throw Keg/Parrot and have to wait for it to respawn) now have a slightly transparent "mainbar" that goes from gray to red and finally yellow. - The small indicator that appears when you're hit and points at the last known damage is now a little bit darker, making it less obstructive. It should still be easily visible. - The whole damage indicator was merely a "Fullscreen Edge" blowout, this has been changed so now whenever you get hit, you'll see subtle images of blood scratches. - A proper damage indicator has been added that is next to the health text itself, whenever you get hit it will say "HIT". Sadly, due to limitations, I was not able to make a simple special bar, instead I had to rely on making something simple but not exactly useful, although it is very minimal itself. - Special bar/circle has been removed and instead replaced with a small text overlay that appears only when Special is full or semi full (around 85%). 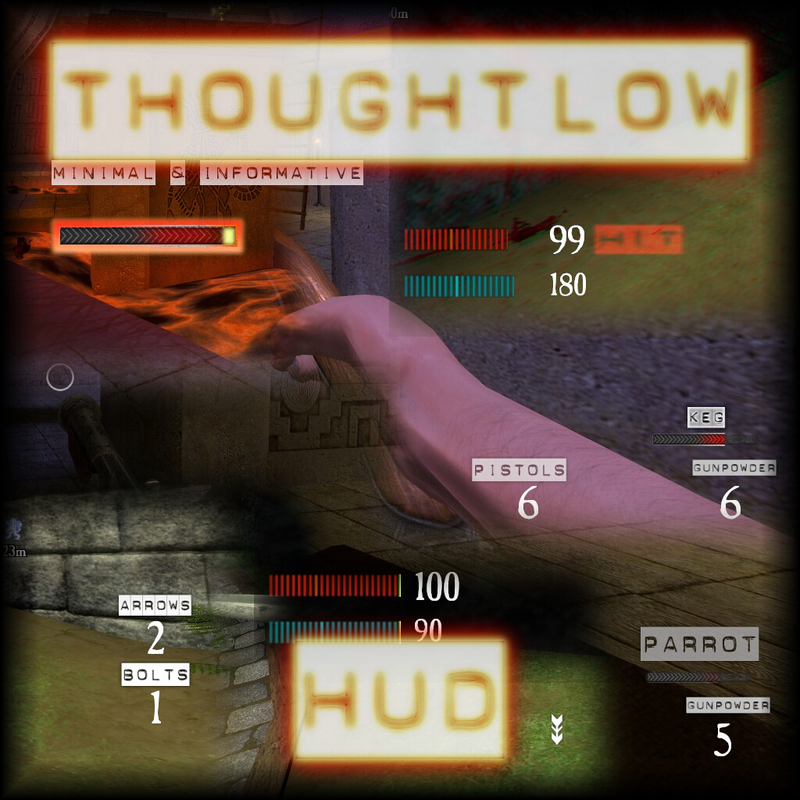 'Thoughtlow' is a little tongue-twister that comes from "Thought" and "Less", in essence the premise is "Think less", fitting the Minimalist attitude on the HUD. Replacing "less" with "low", it comes out as 'Thoughtlow', which could give many spelling or/and pronunciation difficulties, such as "Thought Flow", "Tough Flow" or even "Tough(t) Love" and so on. In short, I had no idea for a cool name, so I just came with a tongue-twister. I love the idea of the minimal HUD, I was working on one myself for awhile. I'm not a fan of the font you are using for the text names, it's hard to read and blocky being punched out of the white. Maybe use something more like Helvetica if the idea of it is super minimal. Or Verdana is used in other placed in the game and is not bad. Just a thought if you're taking feedback. That 'Blocky' text is the important part of the HUD, but I can try making "Modules" anyways, just small 'addons' for the HUD itself that make some small changes to it. For example, I already have in plan for a different healthbar and armour bar method.